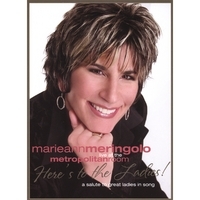 CD & DVD Package Recorded Live at the Metropolitan Room. A celebration of wonderful songs and the ladies who made them famous. Peggy Lee, Rosemary Clooney, Dionne Warwick, Edith Piaf, Barbra Streisand, Judy Garland and Nancy LaMott are some of the divas. FOR THIS ALBUM AND FOR FEMALE VOCALIST! Marieann thrills her audiences wherever she performs. joe’s pub…at The Public Theater, The Town Hall, Metropolitan Room, The Russian Tea Room, The Rainbow Room, The Hammerstein Ballroom And Tavern On The Green, or performing at important benefits and College Universities around the country. She is a performer Who always leaves her audience cheering for more! Here’s To The Ladies! A Salute to Great Ladies in Song. And the internet around the world. Her voice has also been found playing on Selected United Airlines flights as well as the Vice President’s airplane…Air Force II and has performed live at the United Nations!